Home Health £35 million cuts to children’s Mental Health services: Speak up to stop CAMHS cuts! In January 2015, the government pledged £1.25 billion funding for improving children's mental health services. A Children's Mental Health Taskforce was set up and produced some findings in a "Future in Mind" report that we highlighted with our own views in March. One of the stakeholders in this Taskforce was Young Minds, the children & young people's mental health charity. The charity's staff have been doing some digging and yesterday released an analysis that revealed £35 million has been cut from children and young people’s mental health services across the UK in the last year (that's just ONE year). Although if you look at the tables, the downward trend in funding levels has been continuing for number of years - not every Local Authority or local health authority (CCG) or Mental Health Trust - but most. These are not directly central government cuts but they are a result of its reduced funding to local council, health and mental health authorities. They, in turn, look to make cuts to staffing levels and Child and Adolescent Mental Health (CAMHS) budgets have not escaped. No one wants their area to have its budget slashed but health and care services for vulnerable children should surely be a vital area to exempt. Young Minds collated this information from making Freedom of Information requests (the government will probably try to ditch the FOI laws next). Their research showed that from 165 Clinical Commissioning Groups (CCGs), 97 local authorities and 37 Mental Health Trusts there has been an actual cut of £35 million across the board for Children and Adolescent Mental Health Services. 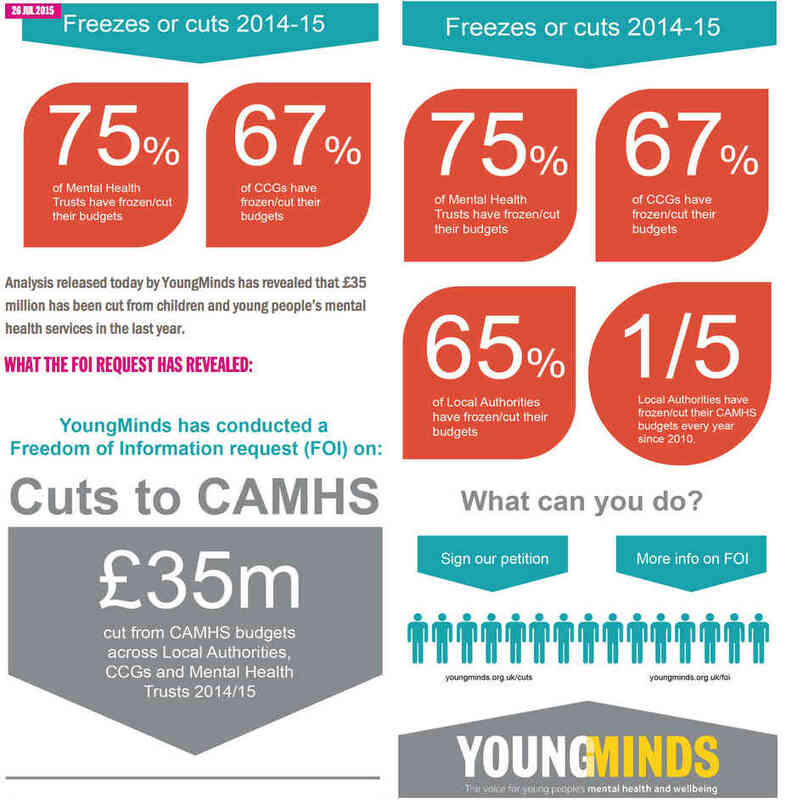 Over 1 in 5 Local Authorities have either frozen or cut their CAMHS budgets every year since 2010. The Children's Mental Health Taskforce report said, "Many of our proposals require a different way of doing business rather than further significant investment...National organisations must play their part but we believe that even more progress can be made rapidly at the local level. This will require local leadership and ownership." Well, at a local level, they've certainly been doing that - they've 'done business differently' by cutting right back on funding. I'm not sure, however, that's what the report really intended. And as to the report itself, how long will its recommendations take to be adopted (if they are) and implemented, backed by that £1.25 billion? In the meantime, how many mentally ill children will dumped on the end of a very long waiting list or told their particular crisis doesn't meet the criteria until business really is differently (in a good way)? Our family has personal experience of CAMHS cuts. In our case, we managed to access some useful Family Therapy. In the wake of my becoming disabled with Ehlers Danlos syndrome, we all had to re-evaluate our family dynamic, particularly as our children have special needs of their own. Roles have changed, expectations had to be adjusted and I, personally, felt (and often still do) that not being able to do as much meant I was letting the whole family down. This change was hard to come to terms with for everyone. However, after a number of sessions, the Therapist, with whom both sons had become comfortable, moved on and she wasn't replaced. And so ended our sessions, even though we were nowhere near finished. This incomplete therapy has had some significant knock on effects within the family. I believe that action needs to be taken immediately to reverse these cuts. Perhaps some of this fabled £1.25 billion can be released now and spread around to bolster existing services and rehire staff that may have been lost. So while the big idea's roll out is being formulated, the children who are currently suffering the results of these cuts can be helped. It is nothing short of criminal - in my opinion - not to mention hugely short-sighted - that children's services are targetted AT ALL. This is a generation of tomorrow's adults upon whom is heaped pressure after pressure of testing and exams, austerity cuts to their family income (and the stresses that brings to all) and the incessant hum of a largely uncontrollable social media. Any child could be in danger of losing their childhood to the painful fog of depression, anxiety and other related mental health problems as a result. And if the child has existing conditions such as ASD, ADHD to name just two, this risk is even greater. At a time when there is a growing understanding that poor mental health always has physical repercussions, to hack into mental health funding is just plain stupid. I really wish there was a big 'pause' button so we could just stop, take a breath and begin really to do things for the good of the individual, not the good of the system and the already wealthy who control it. It is almost as if this is some 'survival of the fittest' game, isn't it? So what can you do? We all, as parents and citizens need to start making our voices heard and not just shrug and feel helpless. Young Minds have an online petition you can sign to protest against CAMHS cuts. Write to your MP to raise your concerns, using the Young Minds data. Tell them your experience. Comment on the post here and tell us your views and experience. We like Facebook comments, but please consider pasting them here too as they won't be lost like they will on Facebook. Don't forget you can tell us about good experiences too - and what was good about it. Spreading parents' views of good practice is vital. Help! I’m a parent carer and I’m on my VERY last nerve! I will definitely sign the petition and write to my MP. Children and young people’s mental health should be given the same priority as ‘physical’ illnesses, if not more in some cases. Our local CAMHS have been brilliant helping my son, despite the fact they have no knowledge of ASD. He would be devastated if this support ended, as would the other kids they help. They might not ditch them. But a tenner says that they will try to comprehensively gut them – and this, along with the assault on judicial review, will be a body blow to our ability as parents to hold public bodies to account.